The no. 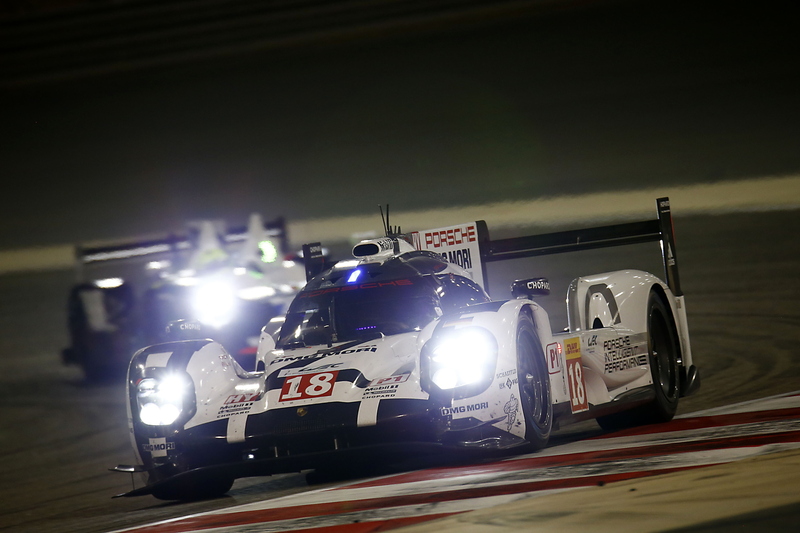 17 Porsche 919 Hybrid crew of Mark Webber, Brendon Hartley and Timo Bernhard were crowned the 2015 FIA World Endurance Champions after the Six Hours of Bahrain but it was the no. 18 sister car of Neel Jani, Romain Dumas and Marc Lieb that triumphed in the season finale. After qualifying on pole position, the no. 17 Porsche was almost immediately on the back foot as a throttle actuator problem forced Timo Bernhard to pit on lap 16 (just half an hour into the six-hour encounter), losing four and a half laps to the LMP1 leaders. Some quick repairs by the Weissach mechanics stopped any further losses but Bernhard and Hartley were only able to get up to sixth until the no. 8 Audi drops from a likely podium position with a mechanical problem, elevating the no. 17 919 Hybrid to fifth as Webber takes the wheel in the race’s latter stages. After difficulties for the no. 17 car, the sister entry was forced to battle with the no.7 Audi for a crucial victory in Bahrain. With a 12-point buffer in the drivers’ and teams’ standings heading to Bahrain, fifth place would be good enough to secure both titles only if the no. 18 Porsche was able to beat the no. 7 Audi. Immediately after Bernhard’s problems though, this looked to be a difficult task with Dumas unable to get back in front of the R18 e-tron Quattro during his stints at the start of the race. Once Marc Lieb took to the no. 18 919’s wheel on lap 59, the German was able to close down the challengers from Ingolstadt, briefly taking the lead after a safety car period on lap 100 before the Audi fought back to retake first place. Mark Webber (centre) was understandably delighted with a first world title. A thrilling side-by-side battle saw the Audi and Porsche duke it out over the Bahrain International Circuit’s 3.36 miles, with Lieb eventually coming out on top (although the Audi was never far back should any problems strike the no. 18 Porsche 919 Hybrid). It was only once Jani took over in the Porsche on lap 119,that Porsche’s hopes of first world drivers’ title since 1986 improved significantly, with the Swiss racer putting in fastest lap after fastest lap to stretch the gap, eventually taking the chequered flag on lap 199 with a near 90-second advantage. Webber, meanwhile, survived another throttle actuator in the no. 17 Porsche to come home in a lonely fifth place, ending the crew’s run of consecutive FIA WEC victories but securing an even bigger prize: a first world championship for the team to go with Porsche’s manufacturers’ title. After a difficult season for Jani, Lieb and Dumas, the no. 18 Porsche’s triumph was just rewards.